Adapt this ball control soccer drill in training, or get creative and add some things to it. Becoming a better soccer players takes a lot of work and dedication to training. The harder you work in training, transfers to how hard you will work in games. Set up 8 cones into 3 small squares next to each other, 3 - 5 m/yd x 3 - 5 m/yd apart. This should create channels through which the player will move with the soccer ball. At the end, player can take a shot on goal, or bring the ball back through the channels once again to the starting point. 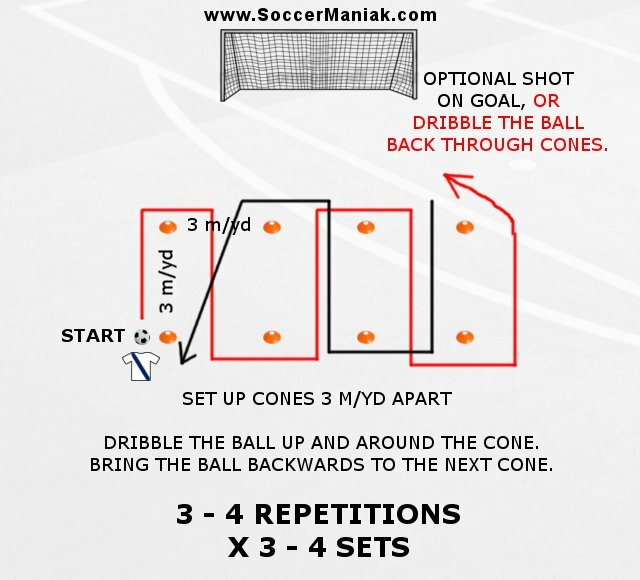 This cone set up can be used for many different variations of ball control. Short touches with the right foot only. Short touches with the left foot only. GET CREATIVE and simply don't let the ball stop. MORE touches for BETTER control.